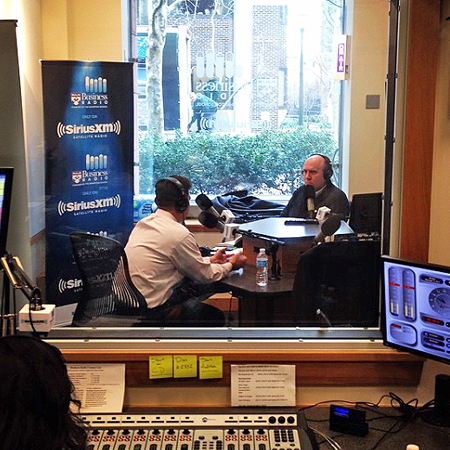 Broadcasting from the Wharton campus, Business Radio Powered by the Wharton School airs via satellite on Sirius XM channel 111. The 24/7 channel features expert information on a wide range of business topics from world-renowned and distinguished professors and alumni as regular weekly hosts, plus executives, entrepreneurs, innovators and other experts as special hosts and guests. Business Radio covers every aspect of business in an informative, entertaining, and approachable manner — from the biggest headlines of the day to the nuts and bolts of building a business from the ground up — with many shows offered via live, call-in format. Dawn Graham, Wharton MBA for Executives Career Director, hosts the most recent addition to the weekly line-up, “Career Talk,” Mondays at 1 p.m. Eastern Time. Graham advises listeners on ways to excel in interviews, strategies for effective networking, and tips for negotiating great offers in the call-in career-focused program. Other popular programs include: In the Workplace (Thursdays at 5 p.m. Eastern Time) with industrial relations expert Professor Peter Cappelli as host, “Entrepreneurs are Everywhere” (Thursdays at 4 p.m. Eastern Time) with start-up guru Steve Blank hosting from Wharton’s campus in Silicon Valley, and “Your Money” (Tuesdays at 5 p.m. Eastern Time) with Boettner Chair Professor Kent Smetters as host. The advice, information, topics, and real-life people and businesses explored on the channel help listeners of all ages, backgrounds, and levels of experience — entrepreneurs, start-ups, generations of a family business, and seasoned business executives alike — to navigate the 21st century business world. The Trulaske execMBA Program launched a new Professional Advancement Series (PAS). This comprehensive course spans the 21 months of the program, covering topics that address students’ professional development. This highly personalized series includes customized outcomes and action plans that focus on “promotability” characteristics, based on each student’s needs. According to feedback, students wanted more content focused on professional development, more one-on-one executive coaching, and more opportunities to network with each other, and corporate contacts. The concepts and theories included in the new PAS help maximize professional growth. Examples of sessions and workshops include: Reinventing You: Promote Your Brand; Building Engagement through High-Impact Leadership; Building Success through Resilience and Persistence; Leading with Vision and Purpose; Leadership that Gets Results; and Driving for Career Success. As part of the series, all execMBA candidates work with an executive coach. As part of this personalized experience, students may focus their coaching calls on a variety of personal and professional goals, including leadership development, career transition, time management, and communication. The PAS also includes a series of dinnertime keynote workshops and moderated conversations for current students and alumni. These value-added, interactive presentations provide unique and cutting-edge content and skills to participants. Examples of sessions include Tough Calls: Handling Difficult Conversations and Speaking on Your Feet: Successful Public Speaking when Things Don’t Go as Planned. ESPAE Graduate School of Management recently developed an intensive, three-day boot camp that helps students apply lean start-up methods to generate business ideas. During the boot camp, students learn how to validate a business idea using the lean start-up method. Entrepreneurship professors lead sessions with the support of selected school alumni who play the role of mentors for each team. On day one, students propose their ideas, and the best ones are chosen during the pitch round. Owners of the best ideas pick their team members. Through the sessions, participants apply lean start-up methods and learn how to use the Javelin Experiment Board and other up-to-date techniques. Another important part of the training involves “going to the real world,” asking potential consumers their thoughts and acceptance of the proposed product or service. Gathering consumer feedback comes at an early stage and offers students the opportunity for real, practical, and productive feedback on their business ideas. It also helps them think about the optimal approaches in building interdisciplinary teams. The new World Executive MBA marks another step in CEIBS’ and IESE’s partnership of 20 years, adding to the list of programs that the two business schools already offer jointly: the Global CEO Program, the CEO for China Program, and the joint Ph.D. This track record of delivering programs together helps ensure a more cohesive experience for participants.